Thursday’s day of action focused on the theme of “welfare not warfare” with some excellent speakers and some pretty unique creative action! At the centre of the day, ‘Conference at the gates’ brought together a range of academics, students and activists to present their research in the shadow of the world’s largest arms fair. Blurring the lines between protest and academia, speakers discussed a range of themes related to the arms trade and militarism. The day started with a panel discussion around themes including militarism and the body; understandings of pacifism post-9/11; and the ideology driving the Israeli occupation of Palestine. As the first keynote speaker Kim Hutchings started her presentation, activists blocked a nearby road to disrupt the delivery of an armoured vehicle to the Excel centre. In probably a world first, the entire academic conference was then moved down the road, and Kim’s presentation on “war and moral stupidity” continued alongside the blockade! Passersby stopped to listen to the talk and join in the action. They helped to extend a massive “welfare not warfare” banner along the side of the truck carrying the weaponry and joined in with activists’ chants of “study war, no more”, as the truck was prevented from entering the Excel. It was only minutes after the conference had headed back up the road, that activists spotted a truck laden with a naval vessel, which was then also temporarily prevented from entering DSEI. The day continued with more insightful and moving talks, workshops and musical performances in the sunshine, opening up a unique space for sharing ideas and building relationships. The conference closed with an interactive workshop session led by Forces Watch. As they explained, the military and the arms trade play an increasing role in universities and schools. As government funding is drained from universities, the arms trade and the military are moving in. Throughout Thursday’s event, it felt like we reclaimed some of that space through talking, learning and taking action together. 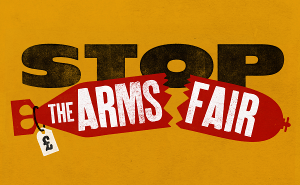 The week of action continues on Friday with a day of action highlighting the link between the arms trade and the current refugee crisis, calling for freedom of movement for people not weapon. Any news/contact from Corbyn yet?